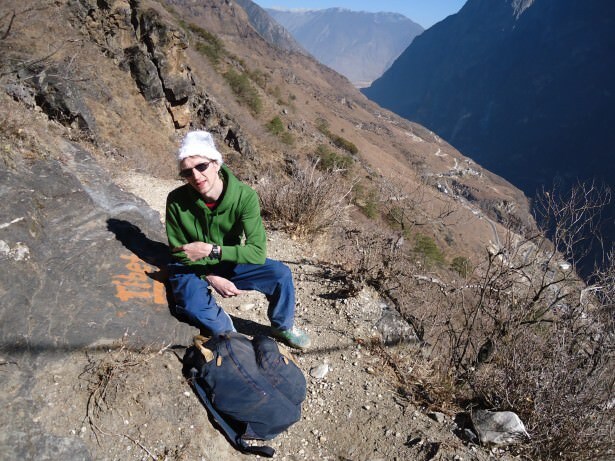 I haven’t been to Tibet yet – it’s on my long list of places to go, but recently I hiked near the Tibet to China border while staying in the high altitude Province of Yunnan. 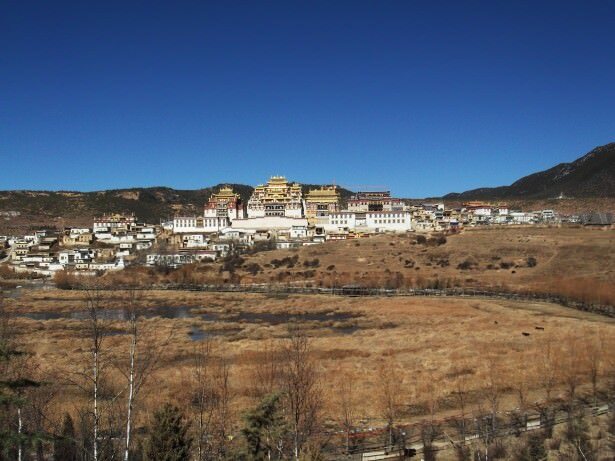 I based myself in the magical city of Shangri-La (also known as Zhongdian). It was time to make the mandatory visit out to Ganden Sumtseling Gompa, a 300 year old Tibetan Monastery in this remote part of China. This was some adventure. I didn’t go to Tibet, but I got a taste for it, inspired by this awesome visit! It’s not just the monastery that is impressive, it’s the views of the countryside that this spectacle is embedded into! 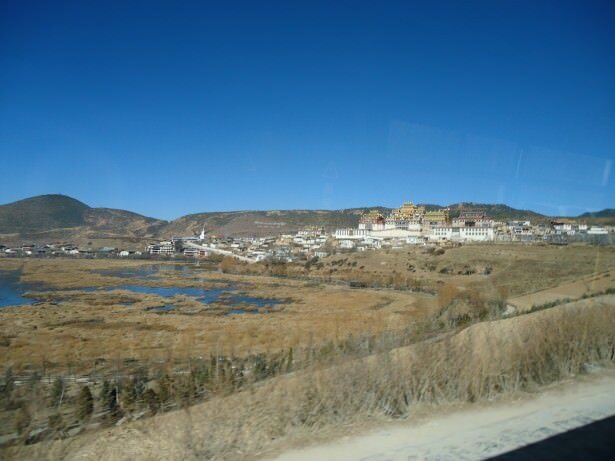 What is Ganden Sumtseling Gompa? 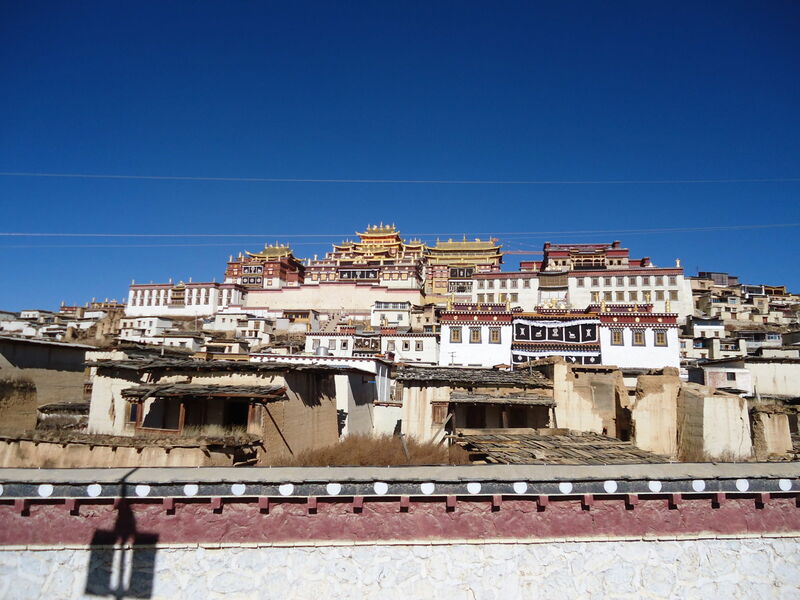 OK, so Ganden Sumtseling Gompa (also known as Songzanlin Monastery on occasion) is a 300 year old Tibetan monastery ‘complex’ – yes it’s a load of buildings bunched together on a hill in glorious landscapes and overlooking a large lake. It is most definitely worth the trip – one of the most famous monasteries in China. The fantastic monastery complex on a hillside near Shangri La – this is the Ganden Sumtseling Gompa! How do you get to Ganden Sumtseling Gompa? OK, let’s start in the city centre of the marvellous city of Shangri-La. Head to the entrance to the “Old Town”, a square faces this by the way, it shouldn’t be that difficult to find. Use only one option to get to Ganden Sumtseling Gompa please – take my advice here, as it costs about 10 US cents to take the local bus. It’s easy, fuss free, fast and it drops you off at the entrance. The cost in local currency is 1 RMB (1 Chinese Yuan). You can ask around the town for this bus but it’s a number 3 bus (written in English). Make sure you’re heading the right way when you get on board though! How do you get to Ganden Sumtseling Gompa? Rough it for 1 RMB on a local bus – fast and enjoyable! 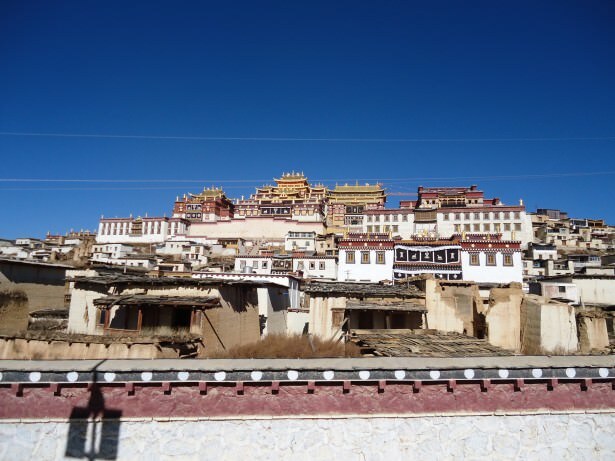 How much does it cost to visit Ganden Sumtseling Gompa? Unfortunately the entrance fee is steep – but if you love travel and new experiences, you should pay it. It costs 115 RMB (115 Chinese Yuan). If it’s any consolation, this includes a free bus ride from the entrance to the site right up to the monastery (mind you though – the walk is scenic and doesn’t take long). On the back of the ticket is also a free postcard. Whoopee do! These are once in a lifetime opportunities, don’t pass it down! 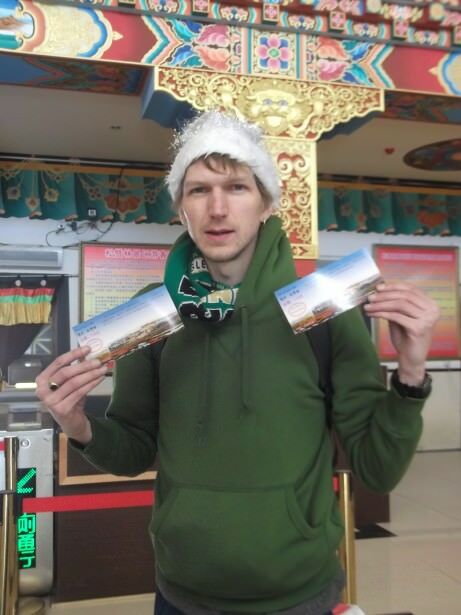 With our tickets at the entrance to Ganden Sumtseling Gompa – it was Christmas Day 2012! 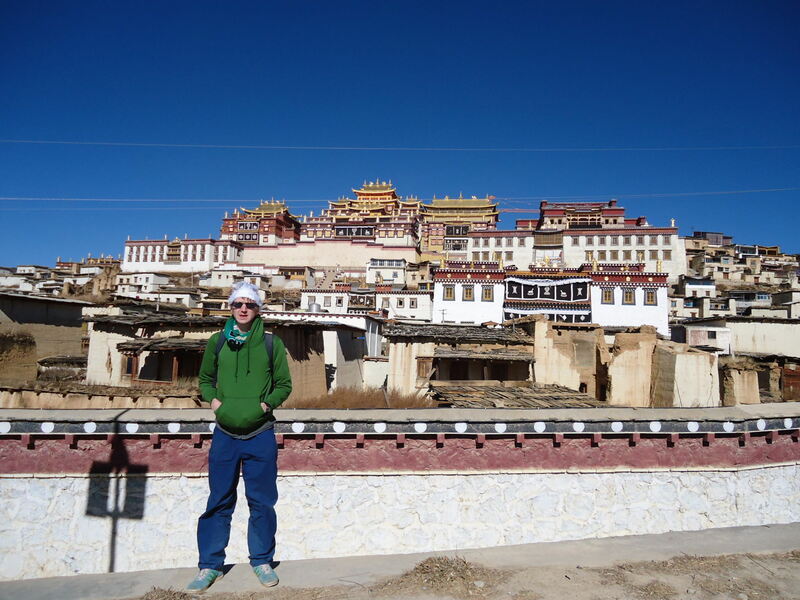 What is there to see and do at Ganden Sumtseling Gompa? 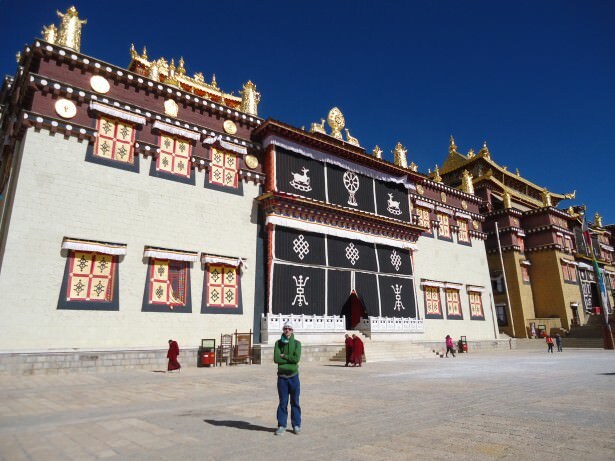 It’s a monastery – you can walk around and watch monks go about their daily business. You can walk around the monk’s quarters. 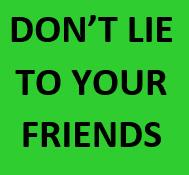 You cannot take photos inside the actual temples. It’s all Tibetan Buddhist by the way and part of the Yellow Hat sect. The main monastery structure at Ganden Sumtseling Gompa is similar to the Potala Monastery in Lhasa, Tibet. It has copper rooves. To be honest it’s a work of art – I’m not even that bothered about the history of it, I just love travel and seeing new places and things. This was a sight I didn’t expect to enjoy, so I took some time to sample it by walking around. The main monastery structure at Ganden Sumtseling Gompa is similar to the Potala Monastery in Lhasa, Tibet. You can also walk around the lake and enjoy the amazing views of the countryside, which are breathtaking to be honest. China also blows me away every time I visit. If this post is overloaded with photos, then that’s the reason why! Apart from the Monastery itself, gasp at the astonishing views and then you realise why you love travelling. Impressed! Where is the Ganden Sumtseling Gompa? It’s 5 kilometres from Shangri La in Yunnan Province in China and sits at a lofty elevation of over 3,000 metres above sea level. It’s proximity to the Tibetan border is less than 100 miles, as the crows flies, although the exact border is debated. Where is the Ganden Sumtseling Gompa? It’s close to the Tibetan border as I found out. There was also a sign for Tibet on the Upper Trail Hike – this was for a hostel however! What Visas do you need to visit Ganden Sumtseling Gompa? No Tibetan Visa needed despite it being a Tibetan Monastery. 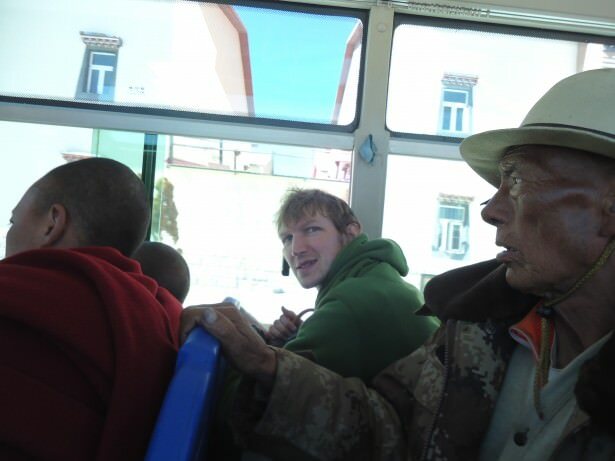 In fact this could be the best way to see a Tibetan Monastery without actually going to Tibet! But it’s cheating of course! So you will just need a Chinese Visa. I wrote a detailed post on the best way to get a China Visa here by the way: Getting a China Visa. I currently own a multi-entry Visa for the People’s Republic of China. Yes, take some water and food with you. 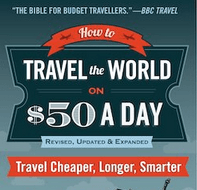 But you knew that already as travellers, this is one of our money saving tips!! My next plan is to actually visit Tibet sometime! 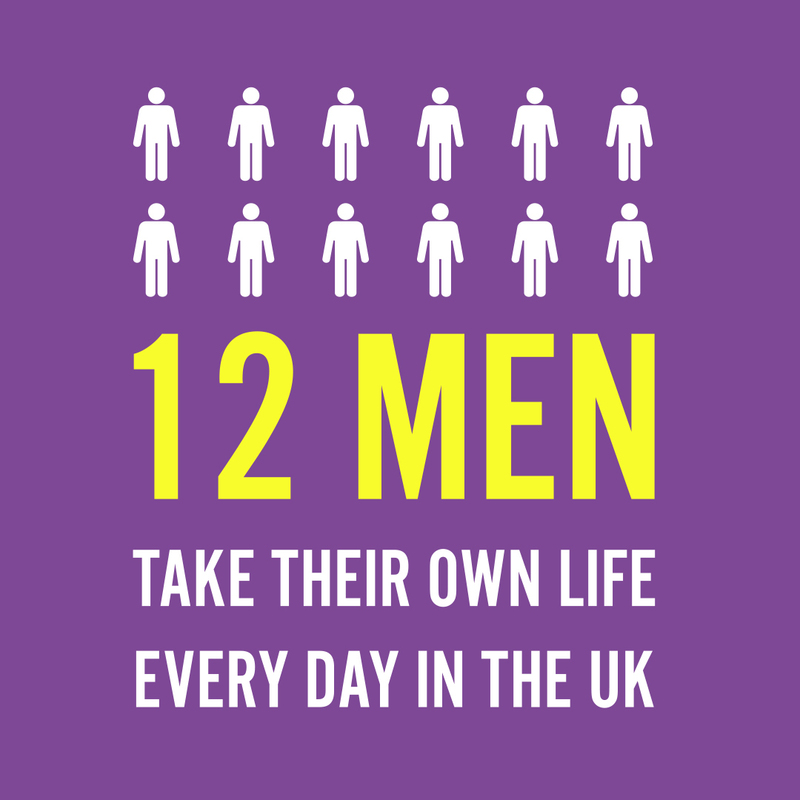 Don’t Stop Living – it’s a lifestyle of travel for me! This entry was posted in Asia, China, Destinations, Destinations, Shangri La, Tibet, Yunnan and tagged China, Ganden, Lhasa, Renminbi, Shangri La, Shangri-La County, Tibet, Yunnan. Bookmark the permalink. ← Thirsty Thursdays: Happy J Pub Crawl – Kiwi Style! !